Sunflowers are an iconic symbol of late summer and the golden autumn days to come, and growing and harvesting them is a fun project for children and adults alike. Learn when to plant them and how to tell when they're mature enough to harvest their healthy, delicious seeds. Sunflowers (Helianthus annus) hail from North America so they're ideally suited for the American garden. They aren't terribly fussy about soil, but they do need plenty of sun-drenched, warm days to thrive and grow their tremendous flowers. Sunflowers are relatively easy to grow. 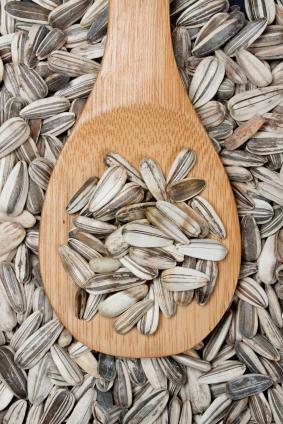 For the best results, purchase fresh sunflower seeds from your local garden center. If you want to get a jump start, plant the seeds in peat pots in early to mid spring, and keep them indoors until after all threat of frost has passed. Choose a location with well drained soil, and sow the seeds directly into the ground in late spring and early summer. Plant seeds about one inch deep in the soil. Mix compost into the soil prior to planting, or add a top dressing of compost after planting. Water daily until the seeds sprout. From that point on, your plants will need about an inch of rain per week. Plan to supplement by watering if needed. 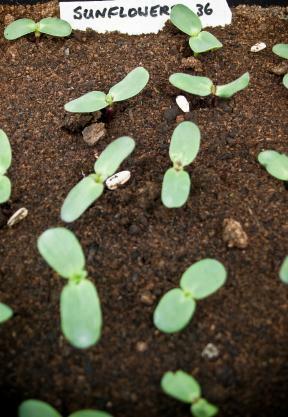 Many critters enjoy a tasty sunflower seedling snack, and they will even dig up the seeds. Chipmunks, squirrels, rabbits and mice all prey on newly planted sunflower seeds or nibble at the emerging seedlings. Sunflowers can also attract insects, most notably grasshoppers. While they aren't likely to kill the sunflower plants, they can leave big holes in the leaves. So, you may want to place a protective sleeve around the newly emerging seedling. Purchase a package of paper cups. Carefully snip around the base of each cup until you can remove it. Discard the bases, and slip a cup over each seedling. During the long, languid summer months, the sunflowers will grow to their full height. Sunflowers come in an astonishing range of heights, from giants over six feet tall to dwarf sunflowers only a foot or two high. The flowers will develop and bloom in late summer and into early autumn. If you want to harvest the sunflower seeds to enjoy them as snacks or perhaps save the seeds to plant again next spring, let the flower heads begin to die back and turn brown. Do not cut them down early because the seeds won't be mature enough yet to harvest. If you're worried the birds and squirrels will get to them before you do, you can cover the flowers with brown paper bags. The bags will protect the seeds, and they'll also allow enough air flow to keep the flower heads from growing moldy. The petals fall off the flower. The back of the flower looks dry and brown. The seeds are plump and noticeable. They are black and you can see brown stripes. Once you've determined the heads are ready, follow these steps to harvest them. Cut the seed heads off the sunflower planta, leaving about a foot of stem attached. Allow the seed heads to dry for several more weeks in a warm, dry place. The drier they are, the easier it will be to remove the seeds. When the seed heads are good and dry, spread newspaper on the ground. Hold each seed head over the paper and rub your hand over the seed head. Dry seeds will naturally fall out onto the newspaper. When all of the seeds are harvested, compost or discard the seed head. Make a funnel out of the newspaper and tap the seeds into a clean container. Sunflower seeds can be used for many purposes. You can use the saved seeds next year to start your sunflowers. Simply gather the harvested seed and store in a jar or container in a cool, dry location. Label the container so you don't forget what you have stored. Keep in mind that sunflowers may be open pollinated, and the flowers may cross with one another. This means that the plants that grow next year may or may not resemble what you grew last year. 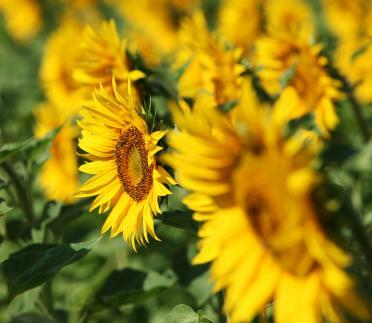 It all depends on whether other types of sunflowers were growing nearby, either in your garden or a neighbor's garden. 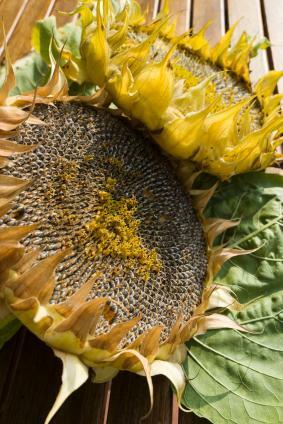 Sunflower seeds grown in the home garden can be used as bird food for wild birds. After harvesting the sunflower seeds, simply store them in a closed container. Make sure you use a container with a tight fitting lid and store the seed in a garden shed, garage or another location convenient to your bird feeder. Dried sunflower seeds are a favorite of mice, chipmunks, squirrels and rats, so be sure to use a tight-fitting lid or else you will have very fat rodents and a very empty container in a few days! Sunflower seeds are tasty and nutritious, and while it's possible to eat too many, they're still packed with good nutrition and a healthy alternative to other snacks. Harvest according to the tips above. Place the sunflower seeds in a shallow roasting pan. Remove them from the oven and let them cool. Store them in a clean container and enjoy. Add ½ cup of salt to 2 quarts of water in a large pot. Add sunflower seeds. The water should just about cover the top. When the mixture boils, reduce heat to simmer. Simmer for two hours. Drain the seeds and spread them out on paper towels to dry. Use paper towels to blot up any remaining salt water. Once the seeds are dry, store them in an airtight container and enjoy. If you prefer, you can leave the sunflowers in the garden and let the birds and other animal enjoy them. They will eat most of them, but they may drop a few on the ground that just might grow into new sunflowers. This can be a good way to continue enjoying these beautiful plants until the first snows of winter finally arrive.